Dispel the Monday blues with this Monday morning to Sunday night challenge. Barry, that is fintastic! (yes, I spelled that correctly) What a great card. I've been working on this all week and am not overly impressed with it. Oh well. I did do the accordion a bit differently, as I wanted to do a graduated increase with it, so changed my scoring. Well, I think I changed the whole inside part, but it is what it is. Barry and Golda, both of your cards are amazing. Love the embellies. 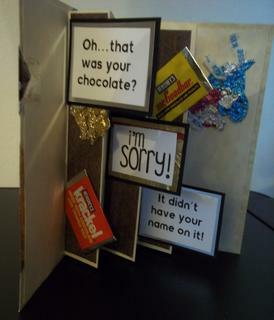 I had fun making my card... mainly because it involved consuming some chocolate. So fun. Barry, I love your mermaid card! So stinkin' cute! Golda, I think your card came out really cool! Graduated inside fold was creative. Kathy, super cute and I bet it has a great smell too - kind of like going to Hershey PA! Kathy, that is hilarious and super fun! Glad you got to enjoy some chocolate in and for the crafting of it! Golda - I love the technique you used on the front of your card! 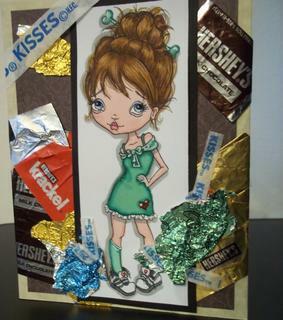 Kathy - Your card made me smile and reach for a chocolate bar...and I haven't even had breakfast yet!!!!!! Return to Your Monday Pick-me-up!